How Does The 1965 Ford Mustang Fastback Compete? The Ford Mustang Fastback first generation was manufactured by the reputed automaker, Ford, from the year 1964 until the year 1973. It is from the Mustang where the pony car class were created. The 1965 Mustang styling include a long hood and short deck and it has proved to be wildly popular and has inspired a host of imitators. The 1965 Mustang fastback is one of the most popular car introduced to the market by Ford. Its body style, 2+2 fastback coupe are the main unique features of this 1965 model. The car also has a GT equipment group package as an option with an upgraded instrument cluster, dual straight exhaust system with flared, chrome tailpipe extensions and also a four inch fog lights in the grille, among other exclusive features. The car base engine of the 1965 ford mustang fastback was upgraded to a 200 cubic inch six cylinder and a 289 cubic inch V8. This 1965 Ford Mustang Fastback was the second bestselling car in the year 1965 from the Ford automakers. Capitalizing on this massive success of the 1965 ford mustang fastback, Ford manufacturing company mainly stayed true what steered success of the previous models. The company introduced over 70 Mustang options which included a more powerful engine, well-balanced air conditioning system and a multiple wheel covers, among many more features. The car exists in two models a V8 model with a approximated 271 horsepower and a standard six-cylinder engine model with a 225 horsepower. The interior and the exterior of the model offers a wide range of color choices and new console options. Some of the cars have a wood grained interior designs. The car also has a special handling package with a 22:1 overall steering ratio. 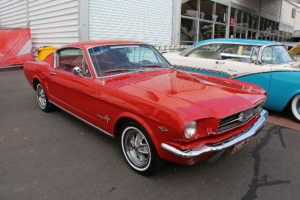 There is also the convertible type 1965 Ford Mustang model with the same engine size and interiors, with all these exclusive designs and performances, the car has remained favorite among several people across the globe. For those looking for old classic automobiles for sale, this is a better option for you.